Hempstead, NY This past Sunday, February 24, 2013, at their home rink and on their home surface where they only have the opportunity to play home games two weekends per year, the Hofstra University Roller Hockey Club’s Division I team made club history as they wrapped up the ECRHA (Eastern Collegiate Roller Hockey Association) regular season on top of the league standings – a feat they have never accomplished in the club’s eleven-year existence. Heading into the last regular season weekend at Skate Safe America in Old Bethpage, NY, with three games remaining on the schedule, the Division I team needed to claim five out of six possible points (2 points for a win & 1 for a tie) to finish with the top seed in the divisional standings before the playoff rounds begin in March. Saturday’s match-ups included University of Rhode Island, a team that Hofstra had defeated three times earlier in the year by the scores of 10-0, 8-1, and 10-3, and Stonybrook University, who had previously fallen to Hofstra 6-0 and 10-1 in the Fall semester. While the final scores were closer this time around, there was no difference as far as the outcomes were concerned. Hofstra rallied back from a 2-0 deficit to defeat URI 3-2, followed by a 5-0 win over SBU in front of a packed-out, rowdy, blue and gold thunder-stick waving crowd for the local rival game. Heading into their final regular season game on Sunday at 1:00pm, Hofstra represented a 15-1-1 league record, with their only loss of the season coming from SUNY Brockport – the same team they were about to face off against in this final game of the club’s best Division I season to date. Would Hofstra be up for the challenge to defeat the team that put them in this position; a position that found Hofstra scrambling for at least a tie to earn that one point needed for the number one ranking in the ECRHA division? Along with the hopes to achieve such an accomplishment and to add to such a suspenseful ending of a season, this day also represented the club’s senior players’ last day of ever playing a collegiate game in their home rink in front of their home crowd. With the dramatic setting in place, along with another packed house of hometown friends and family members, the puck dropped. In a back and forth matchup, Hofstra found themselves trailing 3-1 early in the second period. Captain and Senior forward, Pat Rosa, responded with a power-play goal 1:33 later, and once again with his second goal of the contest just over five minutes later. Assistant Captain and Junior forward, Rich Schwartz, tallied the go-ahead goal at the 9:42 mark of the second period, giving Hofstra a 4-3 lead heading into the third period. Just forty-four seconds into the period though, Brockport was able to answer and tie the game. The game would only remain tied for another 1:19, however, as Hofstra Assistant Captain and Senior defenseman, Chris Culot, scored and racked up his fourth point of the afternoon. Rosa collected his third goal of the game just 1:54 later, assisted by Culot, extending Hofstra’s lead to 6-4 with seven minutes still remaining in the final period of play. Brockport cut Hofstra’s lead to 6-5 with 4:04 remaining in the third, which was then followed by a Hofstra penalty at the 10:17 mark (1:43 remaining in the game). At this point, remember, Hofstra needed to escape with either a win or a tie. Even if Brockport were able to score on their upcoming power-play, Hofstra would still have the chance to get out of the final period and possibly escape with a tie. Instead of allowing such a situation to occur, Hofstra had other plans as Culot, short-handed, notched his sixth point and second goal of the game to give Hofstra a 7-5 lead with twenty-eight seconds left on the clock, and insured a league’s and club's best regular season record of 16-1-1. The buzzer rang. The players left the players bench and swarmed the goal crease of their starting Senior goaltender, Jared Occhicone. The coaches stood proud on their bench, and shook hands with the coach to the right and to the left of them. The players and coaches walked through the post-game line of handshakes with the Brockport players and staff. The Hofstra parents and friends cheered from the bleacher seats. The club’s B Team players, dressed in team warm-up suits and sneakers, joined in on the rink celebration. Some parents and friends walked onto the playing surface to take photographs. The final scoreboard hung in the background, displaying a 7-5 victory. It was an emotional victory for the club, and a long-time goal of theirs that was earned from many late night and early morning practices. All of the commitment and dedication throughout not only this past season, but also the past five years, was finally rewarded and it clearly showed by the looks of everyone’s faces and the tears forming in some of their eyes. While this day and accomplishment is the club’s first goal, which is one that will go down in club history and is one to certainly enjoy, the club now hopes to focus on their Regional Playoffs in Feasterville, PA March 7-10, and NCRHA (National Collegiate Roller Hockey Association) National Championships in Fort Myers, FL April 8-14…or, in other words…Goal #2 and Goal #3. 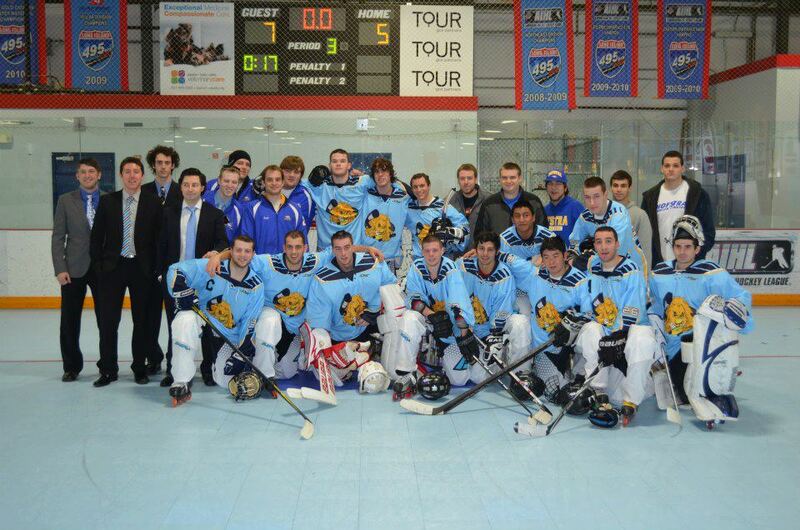 The 2013 ECRHA Awards Banquet will be held during the Regional Playoffs on Friday, March 8. Culot has been nominated for Division I Most Valuable Player, in which he won a season ago in 2012, and Occhicone has been nominated for Division I Most Valuable Goaltender for a second straight year as well. Stay tuned for the results of the award winners and the team’s playoff finish. After attending the Alternative Spring Break trip last spring, we were so inspired by the work we did to improve the lives of a family in El Paso, Texas that we wanted to bring it home to our Hofstra community. We founded a club, Hofstra’s Hope for Humanity, to work with Habitat for Humanity on Long Island, in raising awareness, fundraising, and the building of homes. So far this year, our members have collectively volunteered for more than 1,000 hours in the local community. We had the opportunity to help raise the first walls of a home in Roosevelt, NY in December. A wall raise is when Habitat, along with its volunteers and the new homeowner, build the first walls of the house and ceremoniously raise them. It was a such a heart warming experience to be able to help the family raise the walls of what will become their new home to grow and bring up their children in. Habitat for Humanity in Nassau County has invited back this semester to continue working on this wonderful house. 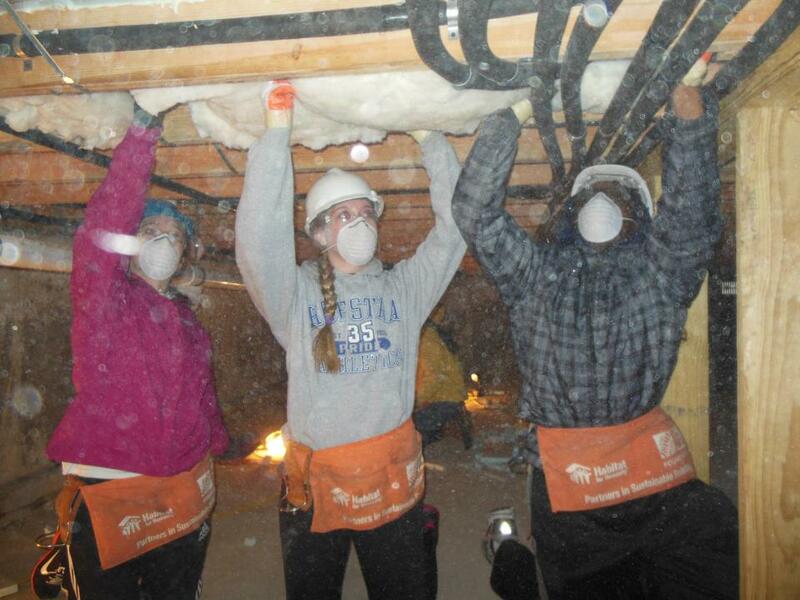 Also this past winter, HHH enjoyed a build day with Habitat for Humanity of Suffolk County. We helped to work on a house in Bellport, NY. Our members enjoyed spending the day on the roof, learning how to shingle. This was a great experience to work with the homeowner and learn many useful skills. This February, HHH was invited back to work on the home in Bellport. When we arrived there was snow on the ground and we were happy to see that the roof we had helped build was still holding strong. This time, the members of the club learned how to put in insulation. It is great to think that the family will be warm in their home for years to come because of the volunteer work that Hofstra’s Hope for Humanity did that day! We also work with other service organizations on Long Island and have even greater things to come. We encourage any interested students to join us on Collegiate Link or e-mail us at HUHope4Humanity@gmail.com.